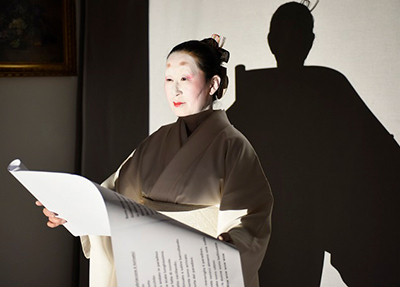 KARASUMARU Yumi will present her performance event on the occasion of Art City Segnala, Arte Fiera in Bologna, Italy. A maximum of 5 guests are admitted to each performance and are invited to choose one of the three stories from the list provided to them. The artist turns into a wise old lady, or a sort of mysterious “ghost”, and begins the story. Japanese tea and oranges are served to the guests. Each performance takes 12 to 15 minutes.